The Granite Mountain Wilderness Trail 261 was listed as one of Arizona’s 25 best summer hikes in the June issue of Arizona Highways. Although listed as an “easy” hike, it was physically taxing for us. Of course, we started about 9 a.m. on a relatively hot day with only 24 ounces of water. 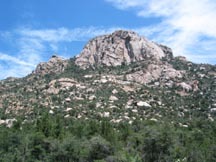 It’s great to have a Wilderness area so close to Prescott. The first part of the hike through piñons, junipers, and ponderosas is easy. From Blair Pass to the Granite Mountain Saddle, the switchbacks are fairly steep and exposed. The pinkish bolders and vista views are noteworthy. We did not continue the 1.5 mile trek to the summit. The return trip was harder and longer than anticipated. Lots of water and a refreshing shower helped revive us. This is a good hike, but be prepared.